Akasa's passive Mini-STX chassis went back to the drawing board since we previewed it a year and a half ago. Initially part of the Euler family (direct touch with the case) the chassis is now part of the heat pipes-based Galileo range. The 300.6 x 154 x 58.5 mm case features two 2.5" bays for storage. 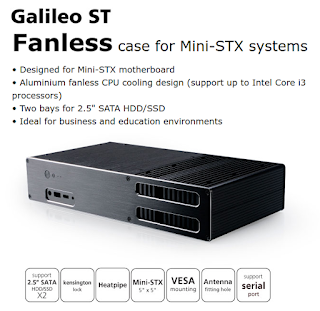 Please note that, unlike most Akasa's desktop cases, the Galileo ST is limited to 35W Celeron, Pentium, and i3 processors. As much as we love our friends over at Akasa, a 30 cm case also defeat the purpose of having a 14 x 14 cm motherboard. 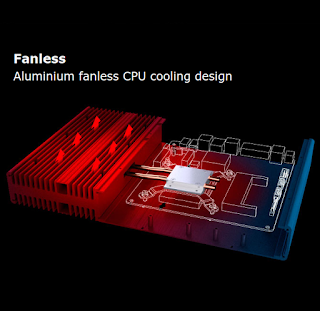 More than ever, a vertical or at least a cube-shaped case would be greatly appreciated.